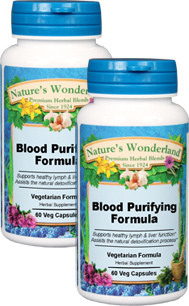 Blood Purifying Formula - 550 mg, 60 Veg Capsules each (Nature's Wonderland) - Penn Herb Co. Ltd.
Jump-start your periodic detoxification program with the Herbal Blood Purifying formula. This traditional blood building blend supports deep cleansing and helps to support the body’s elimination of toxins. Burdock, Oregon Grape Root, Red Clover...superior detoxifiers and blood cleansers. Chaparral, Stillingia…powerful cellular cleansers that also support healthy lymphatic function. Sarsaparilla, Licorice…reinvigorating blood building and blood cleansing tonics. Buckthorn Bark, Burdock Root, Cascara Sagrada, Chaparral Herb, Licorice Root, Oregon Grape Root, Poke Root, Prickly Ash Bark, Red Clover Flowers, Sarsaparilla Root, Stillingia Root; Plant Cellulose (Vcaps™) - vegetarian capsules. Assists the body’s natural detoxification process; supports healthy lymph and liver function; supports healthy circulation. As an addition to the diet, take 1 or 2 capsules 3 times daily with water at mealtimes. CONSULT A HEALTH CARE PROVIDER PRIOR TO USE IF YOU ARE PREGNANT OR NURSING A BABY. See PDF label for additional cautions.